"Sometimes friendship can't be explained." 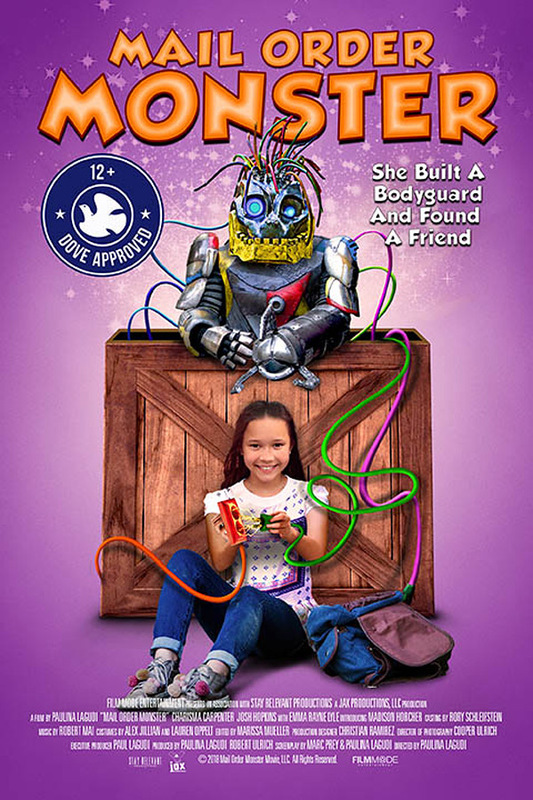 Film Mode Entertainment has debuted the first official trailer for a fun sci-fi indie comedy titled Mail Order Monster, which is the feature debut of producer-filmmaker Paulina Lagudi. The film is about a precocious young girl named Sam who is being bullied at school, and on top of that, her single father has just found a new girlfriend. To cope with her situation, she orders a a robot monster through the mail that promises to solve her problems. Hilarity ensues, and everyone learns some good lessons. Madison Horcher stars as Sam, and the cast includes Charisma Carpenter, Josh Hopkins, Emma Rayne Lyle, and Bill Billions. This looks like an amusing, good-for-all-ages fun time, and the robot monster looks so funky and goofy I can't help but smile whenever I see it. Check it out below. Growing up isn't easy for Sam (Madison Horcher). She's bullied at school and has trouble fitting in. She endures these struggles through her relationship with her dad, and her love of comics. Making matters worse, she's also getting a new stepmom! Desperate, Sam orders a robot monster through the mail that promises to solve her problems. But this friendly "Mail Order Monster" is more than she ever could have imagined. Mail Order Monster is directed by American producer-filmmaker Paulina Lagudi, making her feature directorial debut after a few short films previously. The screenplay is written by Paulina Lagudi and Marc Prey. For more details, visit the film's official website. Film Mode Entertainment will release Lagudi's Mail Order Monster film direct-to-VOD starting on November 6th this fall. Anyone interested in the film?